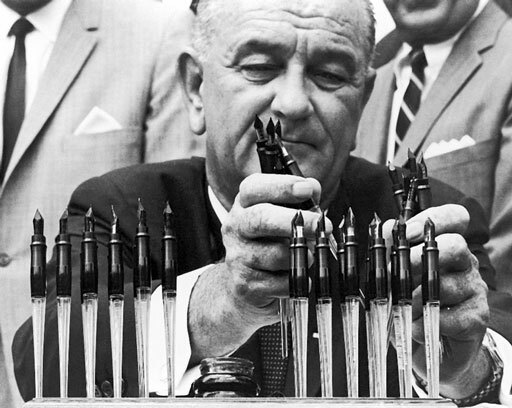 Lyndon Baines Johnson (1908–1973) often referred to as LBJ, was the 36th President of the United States (1963–1969). He married Claudia Alta Taylor in 1934, Claudia was better known as Lady Bird Johnsons. They had two daughters: Lynda Bird (1944), and Luci Baines (1947). And they had a dog, Little Beagle Johnsons. Johnson was in the habit of giving people and animals names with his and his wife's initials. His wife broke new ground by interacting directly with Congress, employing her own press secretary, and making a solo electioneering tour. Lady Bird was a lifelong advocate for cleaning up the nation's cities and highway. The Highway Beautification, limiting the number of billboards along the highway, was passed during Johnson’s time as president and is informally known as Lady Bird's Bill.